Well, the New Year has arrived! Nevertheless, we’re having a little trouble saying goodbye to 2016 (despite how tumultuous it was). In fact, we’re still celebrating our 2016 highlights. Last week, we focused on Hair, Makeup and Skincare. So we figured that this week, we’d shine a light on our favorite wardrobe products from the past year. Certainly, we’ve carried a number of great Jacquard products over the years. However, in 2016 we added to our inventory and two items immediately became hot commodities – Jacquard Airbrush Paints and Jacquard Dye-Na-Flow. And it’s easy to understand why. 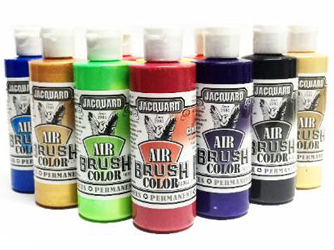 For starters, the vivid and intense Jacquard Airbrush paints are available in six inter-mixable varieties: transparent, opaque, metallic, fluorescent, bright and iridescent. They offer fantastic coverage and are sure to make any project pop. 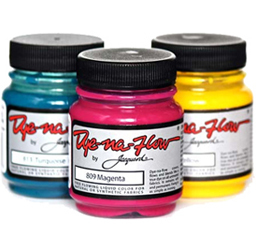 Meanwhile, Jacquard Dye-Na-Flow is the only paint on the market that sinks into fabric like a dye (as opposed to sitting on the surface like thicker inks and paints). This versatile product can be used on many fabrics and surfaces, from silk painting to wood staining. 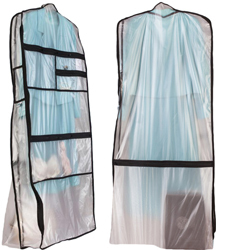 This unique garment bag is perfect for professionals in the fashion, TV, theater or film industries. It’s also great for a special occasion like a wedding. Smartly made from a clear material, you can easily spot and easily access all of your items. Moreover, specifically sized pockets can fit earrings, necklaces and other jewelry; gusseted accessory pockets are ideal for stockings and undergarments; and a large shoe pocket on the back of the bag can fit two shoe boxes or a large pair of boots. Built to last, you really won’t find a garment bag with more thought and care put into its design or construction! 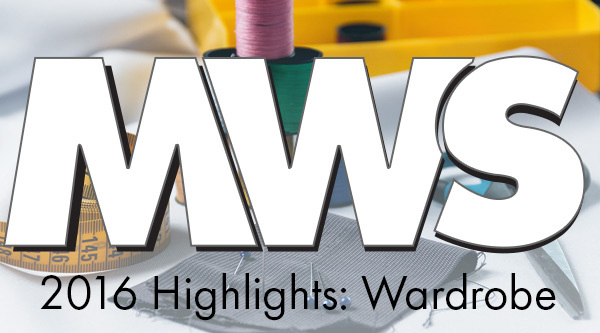 MWS has become the go-to store in NYC for all things cosplay! No matter whether our customers are heading to ComicCon or another conference, we want to help make their vision a reality. To that end, we added both Worbla Black and Worbla Mesh to our inventory. Overall, Worbla Thermoplastic is the ideal modeling material to use when constructing costumes. The black version of this versatile product is sturdier and smoother, ideal for anything that needs fine details. Meanwhile, Worbla Mesh features the strength and tear resistance of Wonderflex. However, it’s cleaner and easier to work with. Sadly, the Meltonian brand of sprays and polishes was discontinued in 2016. 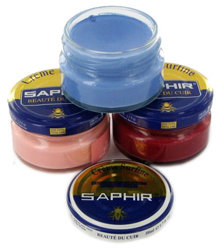 So, to fill that gap, we started stocking Saphir Leather Sprays and Saphir Shoe Creams! 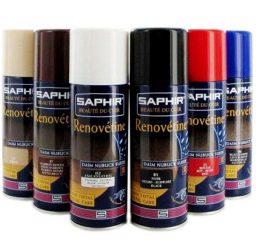 Importantly, Saphir Tenax Leather Color Spray is available in a wide range of colors. This dye can be used with both leather and synthetic leather to refresh and refurbish your shoes. Best of all, it dries quickly. Saphir Superfine Creme Polish nourishes, revives and waterproofs your shoes. All-natural, it’s made from beeswax, mineral spirits and pigments. Saphir Superfine works especially well with closed-pour and shiny leathers which typically don’t absorb high concentrations of waxes. You can always count on MWS to stock the best products from across the globe. And you’ll definitely want to keep an eye out for all the amazing new wardrobe supplies as well as the makeup and hair lines we’ll be adding throughout 2017! Tagged jacquard, mesh, set ready garment bag, shoe spray, show cream, Worbla. Bookmark the permalink.